Slowly, but surely, things are developing. With art, and especially with any effort to try and make money with art, that is usually the best possible thing you can hope for: a little tiny incremental improvement over the past. We all imagine our Leno interview and our runaway besteller, but sometimes it's important just to celebrate that you made some forward progress. This month: seven and a HALF centimeters! Writing About Writing celebrates it's best month ever! We came in just over our prior best month (this last August). 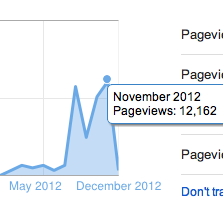 It's about two thousand views over October, and continues a really exciting trend of growth. The numbers are still modest by "real blog" measurements, but it is encouraging. Most blog development advice online is pretty consistent about furthering the idea that it will be between 18-24 months before a blog really takes off. One of the most exciting things about this month's growth is where it's coming from. 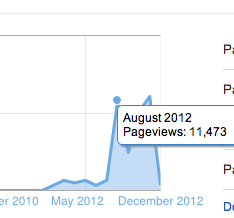 If you look at the stats, you can see that August was a fluke. The article 20 Ways To Sabotage Yourself as a Writer had a small mini-viral explosion on Stumbleupon and nearly 4/5s of August's pageviews came from just that article. The numbers this month are much more spread out. The daily articles are doing a little better, and I have more and more popular articles feeding the main number like river tributaries. 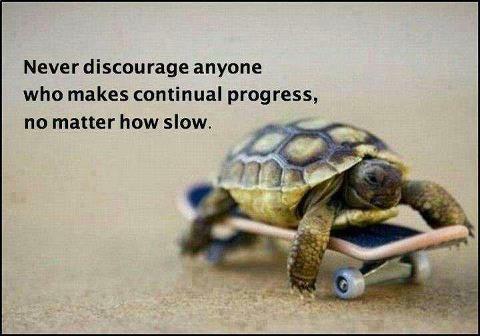 It doesn't feel so much like a fluke. Plan to see more "core" articles in December (things like elements of craft and the glossary entries) as I try to build up the "ground floor" that will make W.A.W. useful. Now that evil Chris is done with NaNo, he'll probably calm down a little, and I can actually write the Fahrenheit 451 analysis without him hacking the signal. As my "real job" at the college goes on winter break, I'll have more free time and I will probably be able to play a little more and write a little more about Skyrim. I also owe some friends a real cranky rant on The Hunger Games trilogy that might show up. And I don't mean to suggest that I know what's going to happen with these genocidal cephalopods, but Writing About Writing's first season will be coming to a close in the final weeks of December. I feel certain that this will come to a head by then. I just have that feeling.